I woke at early dawn on Tuesday morning August 2, put on some warm clothes in the rather chilly air, picked up my camera gear, and wandered over a hundred feet to a nice viewpoint towards the rising dawn sun. After setting the camera up, went back and started heating up some hot chocolate. And as nothing interesting materialized, also began packing up gear. As muted orange phase light eventually reached the peaks, the lake surface was not particularly calm with both sumping night breezes off snowfields of the peaks and a variable breeze probably from turbulence of cross crest air flows. With pack on my back I moved down to the shore where rockslides off 12563 have left talus poking up above the surface that one can rock hop out on. 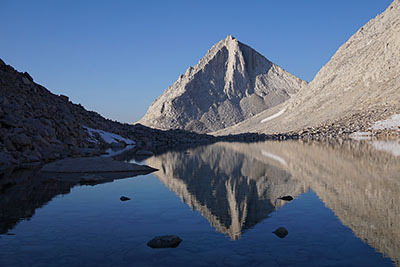 The still shadowed boulders provide nice graphics for possible reflection photos in several directions with the more famous frame towards triangular Merriam Peak. But not only was it not going to be calm enough for that to occur this day but the atmospheric clarity was mediocre due to a light smoke haze the noted turbulence above was delivering. So after patiently waiting, just in case, for about an hour, I picked up the weighty pack and headed up and into the main impediment going around the lake. Despite the nuggets I bring back from these trips, there are always many more left in the ground where conditions did not cooperate. The east shore of lake 11725 has a length of large talus to monkey through that one needs to be extra careful when moving through with a large pack on. A slip or fall on any step could mean serious injury or death to a solo traveler as I. Much of the movement needs to be done dynamically with confidence. Was glad to get past that then moved into higher rambling gear that I would be in for another couple hours. 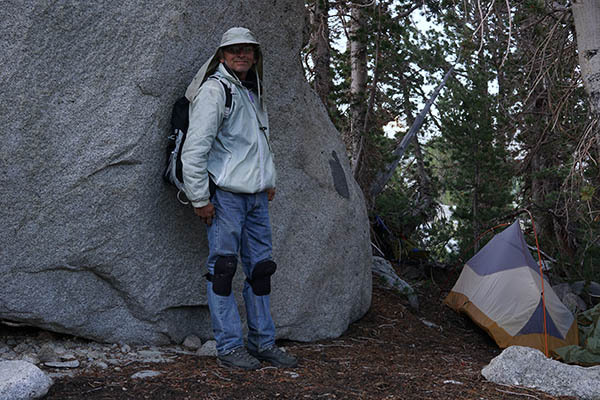 Passed by the tent of and said hello to the two climbers that were having their breakfast. Getting around the next two lakes is a lot of small rocks and some rock hopping along a shore. 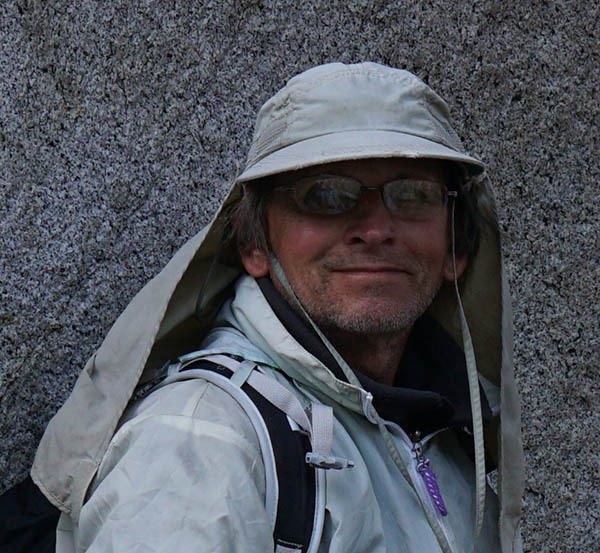 At the next lake's outlet, 11656, waved to another pair of climbers tented nearby and began vectoring eastward. 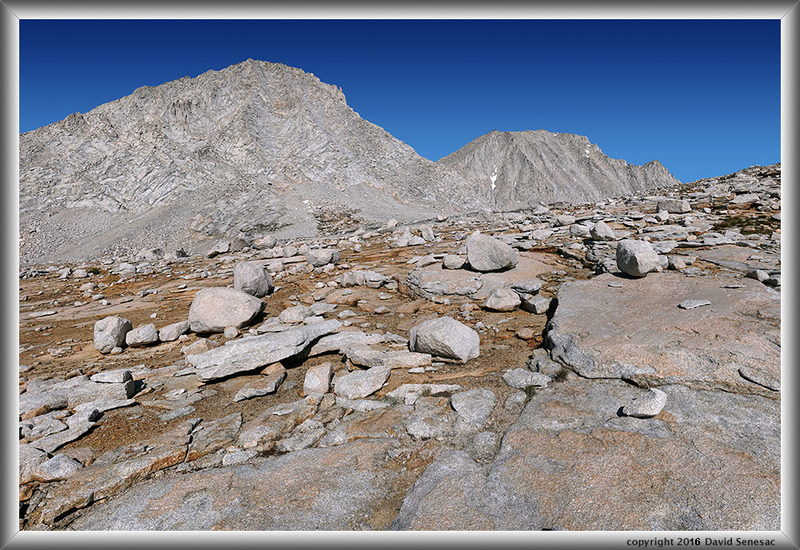 Before I went much, stopped about an area of granite slabs to take the above image with 13053 foot Merriam Peak left and 13280+ foot Royce Peak right. 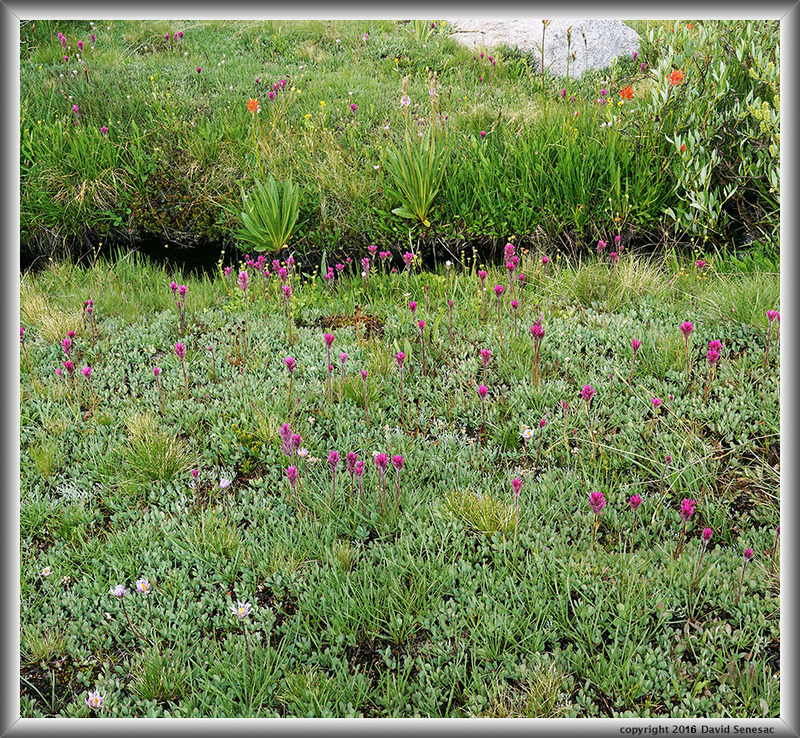 Much of the Royce Lakes zone is rather barren harsh sun baked alpine rockscapes though it does have its greener turfy areas were water runs along with usual modest wildflowers. The landscape is much like that of Granite Park below Italy Pass that I also consider somewhat boring and like there I prefer a bit lower down. From there the route over the next mile continues through the open rockscape dropping a wee bit then climbing up an easy ridge and down the other side towards the brink of a steeper drop down to the bench meadows below Pine Creek Pass and its major horse trail. To the south was a large vista with 6 of the big lakes visible across French Canyon. The atmosphere had a smoke haze so did not bother with any serious photos. I quickly rambled across that mile and actually came to the brink of the drop at one of the steeper sections. But looking down saw how I could zig and zag a bit without anything too difficult and be down at the bottom sooner than if I bothered to move a couple hundred yards along the drop to where gradients were lower. Thus went down and down and was soon wandering across the broad meadows of the bench at 11000. Instead of taking the horse trail down into the canyon, my interests were higher up in an area of small streams, turf meadows, and many seeps that I expected to have better wildflowers. Along the dry south facing route per image at left above, I saw the first patches of Lobb's lupine I'd been expecting about French Canyon and was glad I was out of the barren landscapes above and back down to where it was green and flowery. The window of our high country most magnificent colorful flowered glory is narrow that follows increasing elevation and shading exposure most high country visitors miss because it is not easy to forecast and mosquitoes are still about in numbers most don't know how to cope with. I could see the affects the rather dry summer had on these flower areas and expected during years after good winter precipitation and some early summer monsoon bouts these areas could be spectacular. In the distance could see larger areas of faint blue on the north facing canyon slopes I was heading towards. After climbing down to the canyon bottom I made my way up into the seep areas spending quite a lot of time exploring this way and that. In the end I found a superb camp zone of boulders and large whitebark pines at about 11000 and chose the shadiest spot next to a large boulder. Such timberline clumps of whitebark pines often colonize raised small hills on terrain where tree roots can find bedrock and boulders as a stable foundation to wrap about. Also the mini-hills are drier better drained, have shallower snow depths so melt out sooner versus surrounding low spots. One often sees deer beds in the insulating dry fallen decaying pine needle debris below such tree clumps. There were several other nearby flat spots among the big boulders one could tent at including one where someone had made a fire place that looked like it had been used in the last 3 years. The latter I dismantled. Otherwise it was a zone that probably saw just one group camping every decade as is the case for vast areas of our wilderness away from lakes and trails. 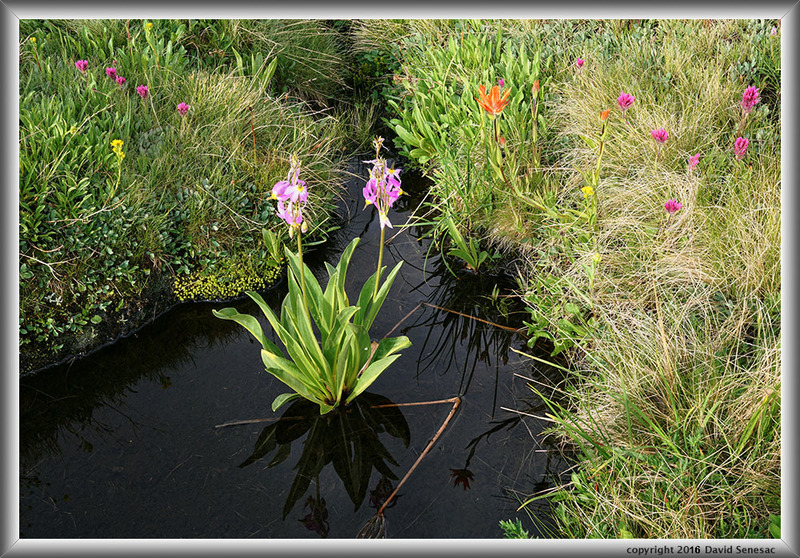 Just below was a fascinating turf meadow with a nice streamlet for clear clean water and several lush seep pools. Above the camp and due west of the little Petite Lakes was a west facing lengthy cliff with a large zone of talus below that was the source for my lush zone. Such talus areas often have long lasting summer seeps below because snow and water down in the boulder labyrinths never see drying sunlight nor desiccating wind much like steep north facing areas. 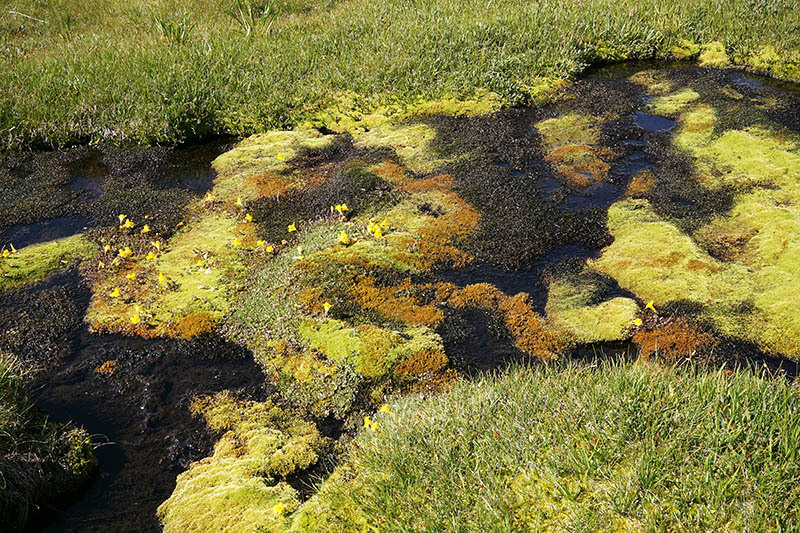 The above left shows one of these mossy seep pools with all manner of weirdness growing in the water. The yellow flowers are monkeyflowers and are growing atop floating moss rafts. The turf itself in such areas is wonderfully soft on one's bare feet like walking on sofa cushions. The grass species evolved to only grow short blade lengths regardless of how much water was available so unlike our urban lawns, these timberline short grass lawns never need to be mowed so are like an ideal golf course. This pool above, one would not want to drink from, had colorful blobs of probable bacteria colonies including a large golden brown one that was atop a white pie layer. Then at the edge of turf were red areas. 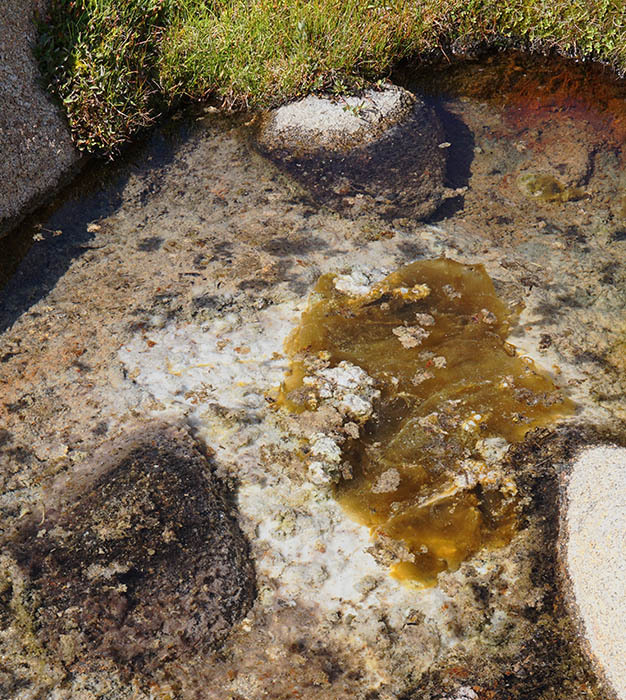 These high elevation mountain turf pool soups may still be mysteries to scientists. That afternoon with clouds about in blue skies free of smoke for once, I did a lot of exploring up and down and around this side of the canyon keying on beautiful blue patches of lupine. There were mosquitoes about, in some willowy areas many, but they did not bother me much with DEET applied. 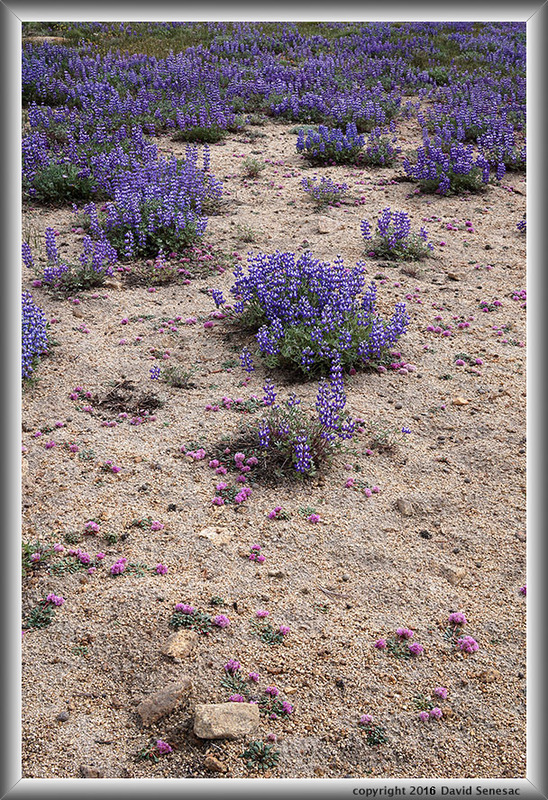 The above shows a dense patch of Lobb's lupine or Lobb's tidy lupine, lupinus lepidus var. lobbii, with the Sierra Crest just north of Four Gables in the background. Below the crest one can see a cliff and below that a talus field which was above my camp zone. The lupine were wonderfully fragrant with bumblebees and other bees very busy in these short lived alpine gardens. 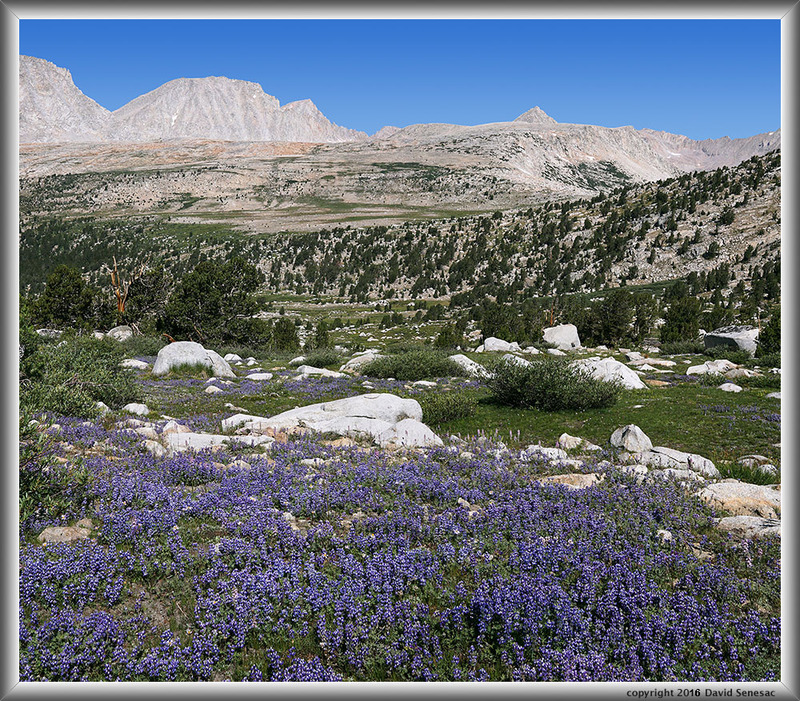 French Canyon has some of the most extensive areas of this timberline lupine species one will find and was a primary reason for my visit. It was fortunate for this photographer that the heavy thunderstorms just before I reached the trailhead on the previous Thursday, now a few days hence, probably provided a significant quick boost to flowering and green leaf growth on these plants during an otherwise unusually dry summer. Once again I retired about sunset and enjoyed a long quiet restful sleep. Thus when early dawn began brightening the sky on Wednesday August 3, I was soon out of my tent, firing up my MSR Whisperlite, drinking hot chocolate, and filling my Osprey Talon 22 daypack. I had bought the 1300 cubic inch Talon before my Silver Divide trip and found it to easily be the finest light weight daypack I've ever owned with lots of features and compartments for organization despite weighing only 24 ounces. I have a habit of stuffing quite a bit of gear and food besides camera gear into my day packs for day trips as I tend to err on the safe and comfortable side. My first destination was L Lake about 6/10 mile away requiring climbing up 200 feet up and over a gentle ridge. Besides day hiking this morning to the lake, I would be looking for a camp spot to return to later in the morning. After working lake areas I would come back over the ridge and work meadow areas near my camp before packing up and making the short mid day move, an example of my semi-base camping style. As I climbed up through lupine fields dominating the top of the ridge, the calm air and relatively clear for once air had me excited with optimism of mirroring lake waters. Cresting the ridge top the still shadowed waters below indeed looked calm. I crossed the stream from Steelhead Lake above and made my way to a viewpoint knob overlooking the lake to take a shot. Within the clump of trees there found yet another remote camp spot recently used by pyro's so spent a couple quick minutes rolling their blackened fireplace stones down a slope. As I reached a bay on the shores below, sunlight had reached the far shore and would soon illuminate my position so I had to work quickly setting up a shot. 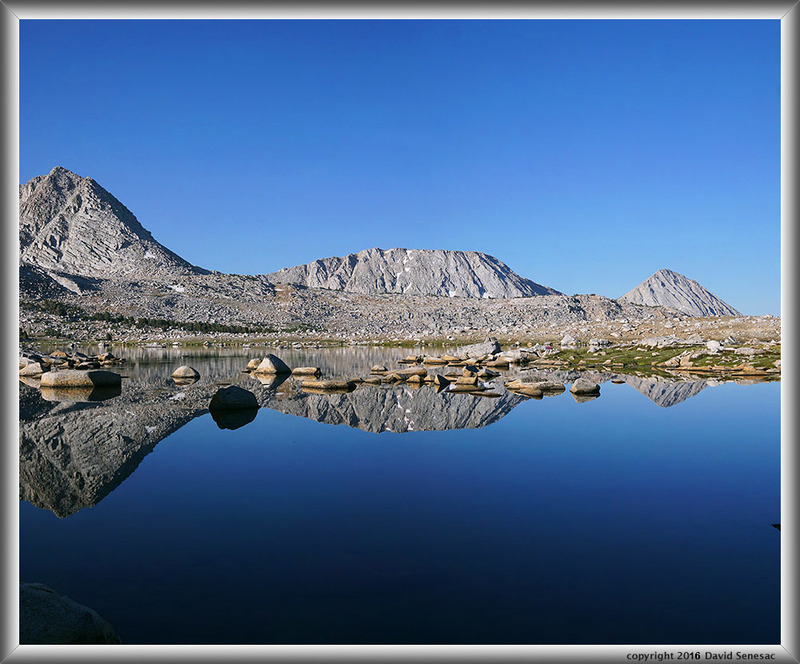 The lake on a wide level bench is one of the finest in the Sierra for lake reflections with numbers of boulders poking above its golden trout filled waters adding interesting near and middle ground features for frames. The image above is what I refer to as a split bilateral mirror reflection. There is one dark boulder still in shade while other nearby boulders a bit further out are in their first sun rays. Reflections in water that is still shaded are more saturated and more importantly for on axis early morning landscapes, one's tripod and body shadow will not show in foregrounds. Thus my need here to quickly shoot. The lake has an abundance of pan sized golden trout that even on calm mornings tend to ripple water surfaces. Thus as I set up for the shot, had first tossed a couple rocks out into this bay in order to scare the little rascals away haha. Do you see the magenta hued fireweed reflecting from the point a bit right of center frame? Next I moved to a section of shore near the Steelhead Lake stream inlet and framed Merriam and Royce Peaks with an interesting foreground of grasses rising in the shallow lake edge waters. See the fish ring against the Merriam reflection? The waters were slightly rippled due to a residual sumping night air breeze still flowing down the stream into the inlet. Intent on completing a few subjects before any breezes arrived, I refrained from pulling out my 60mm lens that would have resulted in larger images, instead content to use the 30mm quickly. 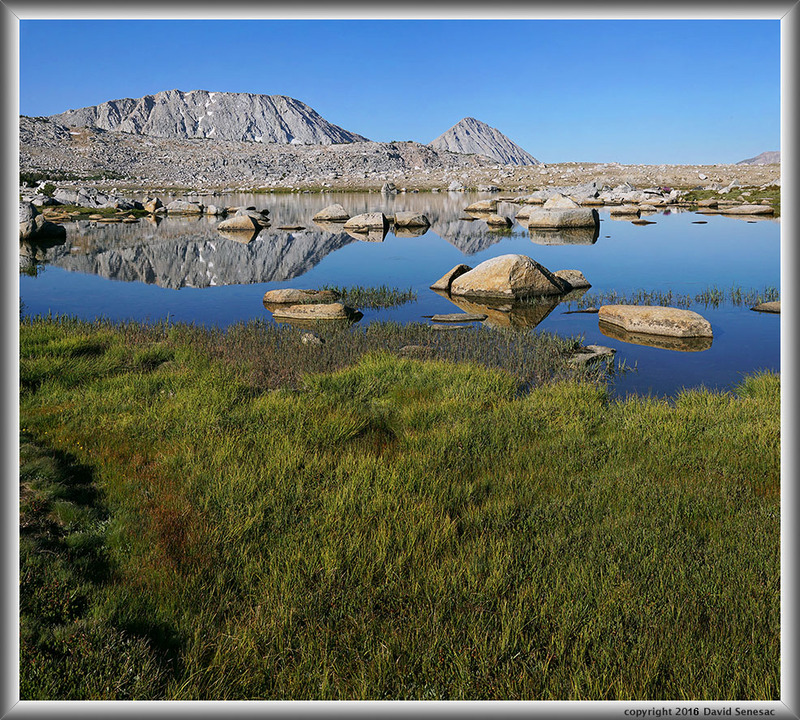 This next image above shows a section of the lake's wonderfully green soggy turfy shore as well as its aesthetic bouldery waters with Pilot Knob at 12248 feet at center in the background, the best peak to climb in Humphrey's Basin for overall views of the large basin and its lakes. The up canyon breeze I was afraid of indeed appeared shortly afterward, cutting short my lake reflection work and sending me instead on a quick survey of areas along the east shore of the lake I might camp at. I had to explore all the way to the southeast end before finding streamlets flowing from above that I would need for an easy no need to filter water source. 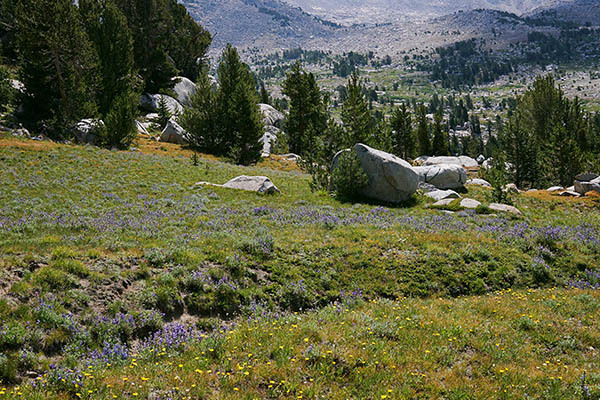 There is a horse trail from Elba and Moon Lakes below that reaches the outlet southwest end of the lake and where there are extensive camp zones within boulder and whitebark pine clumps. Few visitors go beyond there looking for a camp spot thus most of what I saw on the east side of the lake looked rarely used as expected despite being more scenic. Most of the equestrian customers are of course there for fishing and being at the outlet puts them at the center of the zone within reach of the two mentioned lower lakes as well as the Puppet Lake and Starr Lake benches. 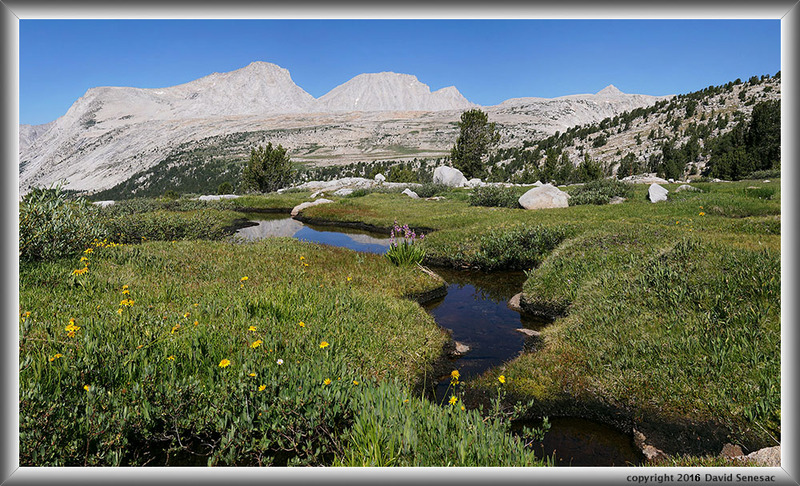 I located a superb spot again on a mini-hill of whitebark pines with extensive seep and meadow areas nearby that had the finest wildflower gardens I'd yet seen on the trip. I quickly rambled back along the lake shore, over the ridge, and back down to meadows near camp. 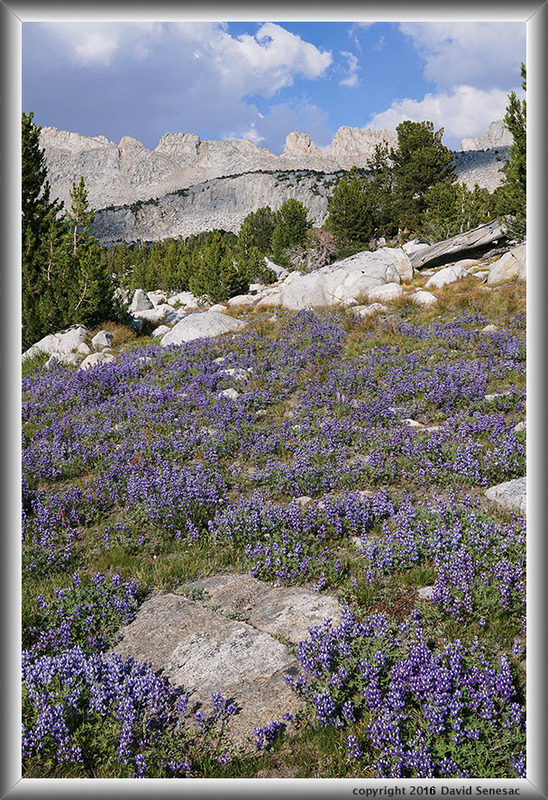 Captured the above image looking northwest with Lobb's lupine and sprinklings of little elephants head in the foreground and Royce Peak behind. Can you see the belding ground squirrel on the boulder mid ground? Well then try the enlarged vertical slice view. Down at my camp spot meadow the last image this morning at 10am above shows yellow hued streambank arnica, arnica lanceolata ssp. prima, and one bog shooting star, dodecatheon redolens, with Merriam and Royce Peaks in the distance. Notice how turf on the edges of these small meadow streamlets is so naturally smooth and curved as though it was manicured with gardener shears? The little meadow stream with deep undercut banks actually had a small population of little golden trout that shows it had to be an ever flowing stream despite the 4 previous drought winters. Back at camp, I packed up for the sixth time on this trip, hoisted my now a bit less heavy backpack, then hiked back over the ridge, along the lake shore, and by late morning up to the camp spot I had found earlier. Thus a leisurely few hours of making camp, filling my 1 liter Nalgene and 2.1 liter Platypus bottles quickly from the nearby streamlet, cooking another 2 serving freeze dried meal, and jumping in the not so chilly lake waters. In fact I set up my camera and tripod for a video, then walked a bit down the turfy and bouldery shore and out onto a boulder I dove off from, then swam back a bit along the shore, climbed back out, and dried off on a nicely warm flat lakeside boulder. A minor breeze was about the bright blue lake waters and so few mosquitoes were about I could lay out without whining visitors. Rested and refreshed it was time for another long afternoon exploratory hike and my plan was to walk all around the big lake including the plateau just west. Before leaving I set up my tent fly as it appeared cumulus build ups were increasing. A larger stream from Starr Lake above also entered the lake nearby in an area full of wildflowers. I explored the horse camp spots near the lake outlet then began a journey across the rockscape and turf plateau that I quickly found had extensive patches of lupine one could not see until within its shallow labyrinths. But because of an increasing afternoon up canyon breeze and cumulus clouds, I declined to work any serious photos with foregrounds or close-ups of flowers while expecting the following morning to be calm and thus workable. I explored locations to set up my tripod as a plan to efficiently work these areas gelled. 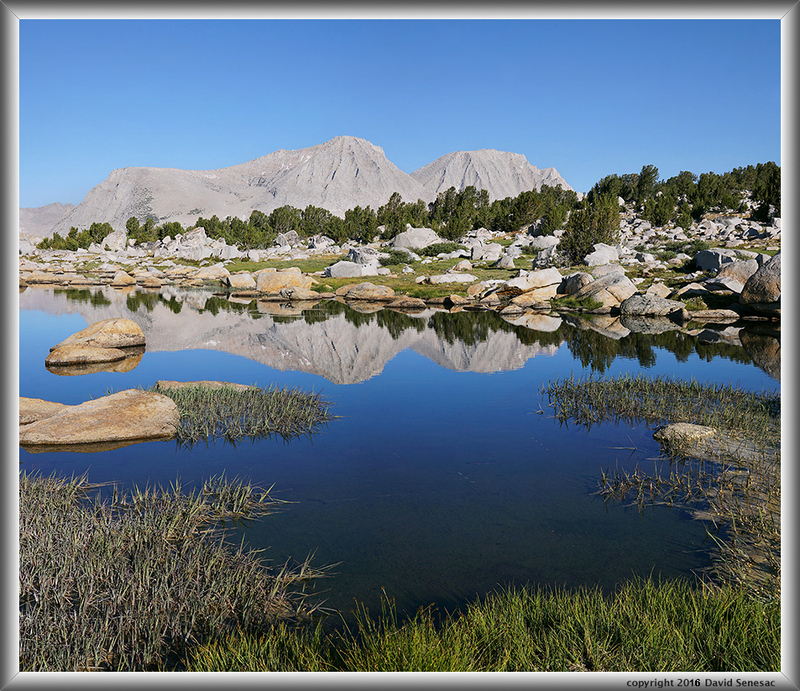 A good sized group on the usual Piute Creek to Pine Creek loop reached the lake and set up camp above the north shore. I spoke briefly with a couple of gals looking out over the lake while a couple male friends cast lures out into the lake waters and others puttered about near their tents. It was near sunset when I finally got back around to my side of the lake. 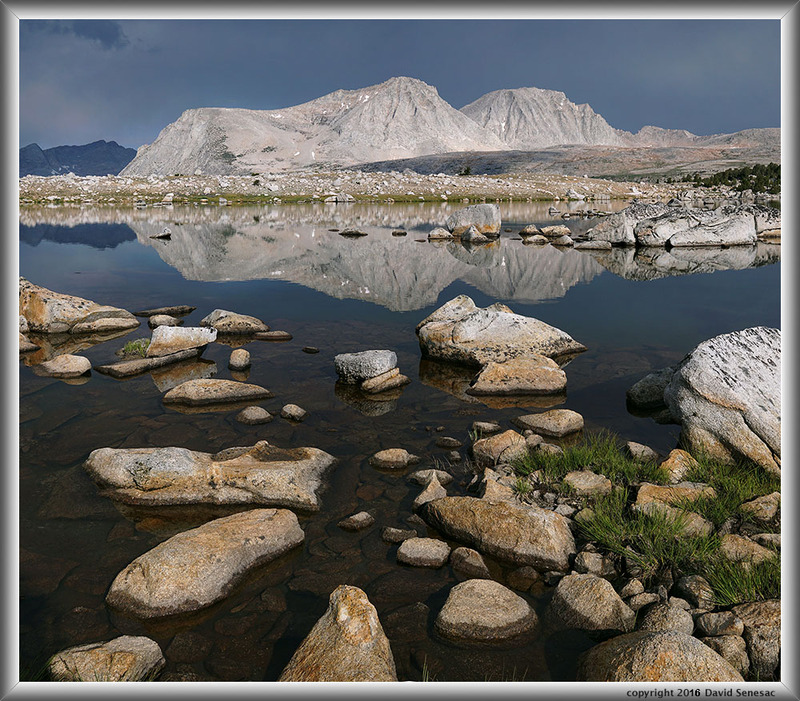 There was now a band of verga and light showers to the north over Pine Creek Pass that was sure to light up nicely at sunset because skies west were without clouds that is a common situation with orographically generated clouds. I set up for a photo along the lake shore but the breezy wavy waters was not the better strategy so abandoned that notion and quickly moved back up to my camp spot that was well back away from and above the lake edge where the waters would better reflect warm cloud color and could capture the shape of the lake as a middle ground band without issues of blurring water motion. My 60mm lens was the easy choice to make a large multi column panorama. Light kept getting redder and at 8:01pm PDT began taking a set of stitch frames using just two focus stack shots per frame since the foreground was well away. I first took some exposure check shots to make sure the all elements in view were optimal then locked exposure, something that in the old days was impossible when working with film. Thus was able to complete all 9 shots in just 150 seconds so cloud movement was minor. Merrian, Royce, and Feather Peaks are at frame left with pyramidal 12563 near center. Showers are visible dropping out of the clouds at frame right over Bear Creek Spire. Because of the considerable warm light off the clouds, the granite landscapes below reflected enough light that features are nicely visible without the usual silhouette effect due to limited image sensor dynamic range. That is quite evident looking at the enlarged vertical slice view. 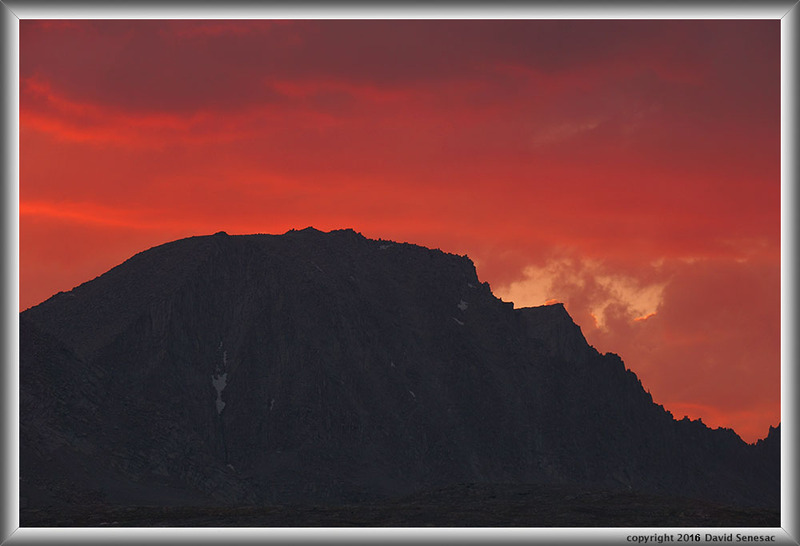 As one that has spent many days in our high country over decades, this sunset was one of the best ever. I was quite relieved after returning home after processing that this large 15400 by 6000 pixel panorama came out so well, enough to make a 50 inch wide sharp print. A bit later at 8:09pm red light peaked per below but by then the reflected light on the landscape had considerably dimmed so the better balance for a wide panorama had indeed been the few minutes earlier even if it was just modestly red. Dawn skies on Thusday August 4 showed dark storm threatening skies that reflected long range forecasts of a possible visit from the Mexican monsoon pattern that had earlier been over Arizona and The Great Basin. If so it was possible to see all day rains and thunderstorms. The large whitebark pines above my tent on its mini-hill was a bit too lightning prone to my very physics savvy knowledge so decided to move my tent down into the hollow next to the mini-hill that had spaces between its several large boulders. Thus got up and outside at dawn, found a reasonable spot where water even in a heavy prolonged downpour would not flow or pool, and began to make the move just as the first drops of water sprinkled down. I temporarily put most of what was inside the tent atop my NeoAir mattress outside. And the sprinkles turned to light rain as I rapidly staked my UL1 and rainfly. As heavier rain began, I was just able to toss all what had been atop the NeoAir through the door then jumped in myself, zipping up the vestibule. It was pure luck I was not caught outside while my protective tent was not ready and gear exposed. My legs with boots stuck out the tent door atop a flat rock I tossed down at the entrance to avoid dragging dirt in. It continued to rain in cycles for the next hour. That gave me time to put on rain gear and organize gear for a morning photo session if showers stopped. Showers did slowly wane and skies brightened a bit though the only blue above was far to the west. It was 7:50am when I finally completed securing my camp gear and moved down the hill towards the lake. Just below camp was a turf hummock dammed set of pools with many wildflowers. One particular subject I'd checked Wednesday was a two stem bog shooting star, dodecatheon redolens, plant right in the water with a beautiful complement of other flowers in the turf beside including Lemmon's and Peirson's paintbrush. Diffuse light through the gray clouds was perfect for the shot and the air was dead calm. I set up my tripod to get the right stem shooting star behind a section of the dark pool while the plant's reflection was in the foreground water. Two dry brown stems from the previous summer floated atop the dark water while reflecting plants stood out sharply as darker silhouettes. Then took 10 shots at F11 making sure the focus stack stitch blend frames would result in a sharp image edge to edge. And indeed the result is the best intimate wildflower landscape I've ever taken. Immediately following the above, moved nearby to another turf wildflower spot that best captured how impressive these alpine lawns were. Western aster, Lemmon's paintbrush, Peirson's paintbrush, bog shooting star, and rosy everlasting, plus a yellow hued TBD species. In the turf besides grass were considerable dwarf bilberry the leaves of which turn a red to purple hue by late August. I moved down to the lake shore while light erratic breezes kept the surface wavy. I set up my tripod for a shot of the dark storm clouds where rain was still falling behind Merriam and Royce Peak. After waiting about 10 minutes, some calm briefly occurred all across L Lake allowing me to fire off a few frames capturing the storm reflection above in magical light. I continued around the lake hoping for another storm reflection but breezes only became more continuous while storm clouds moved north with less visual impact. Out onto the large plain west of L Lake I'd surveyed Wednesday, set up the above landscape showing the extensive patches of purple blue lupine towards Pilot Knob with storm clouds behind including showers falling at frame right. Due to the dry summer, the color was mixed with drying browns of earlier plant species that during a year with wetter early summer conditions might have been a nicer green. 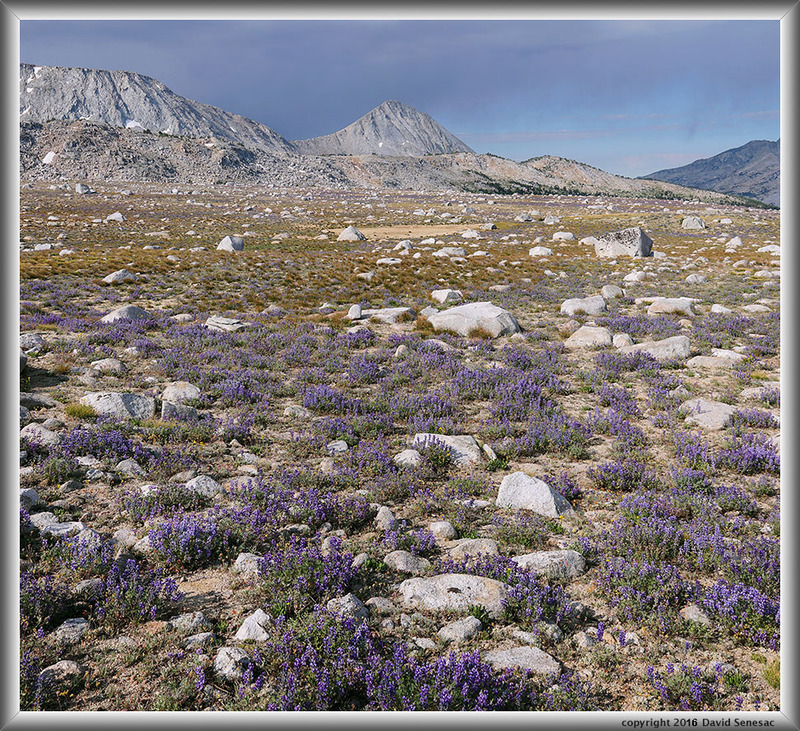 My expectation is that very few visitors to L or Moon Lakes have ever ventured off across this plain even during periods of past summers when lupine were blooming because from trail or lakeside locations the expansive lupine patches are not visible. 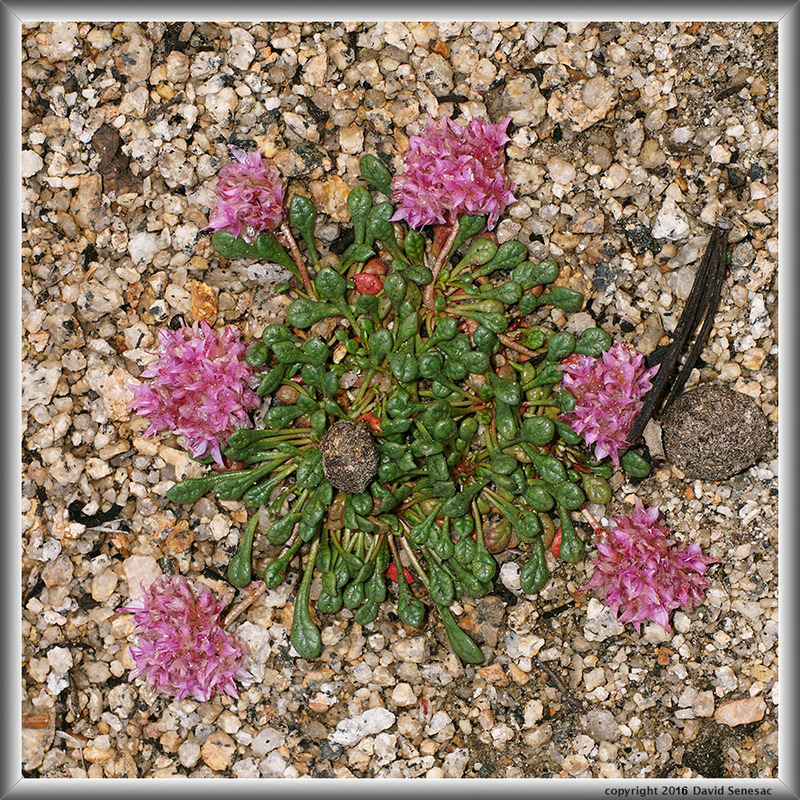 Pussypaws, calyptridium umbellatum, colonized many open granite sand areas between the lupine. With the even diffuse lighting from above clouds, I looked for situations like this that would normally be rather harsh with direct sunlight. However by late morning a stronger up canyon breeze shaking plants made further close-up work futile while flat cloud light mid day rarely offers much for landscapes so I returned to my camp. And later in the afternoon was similarly unproductive as I amused myself exploring more areas above camp. But I did work in a couple wildflower species that lie so close to the ground that breezes affect them little. 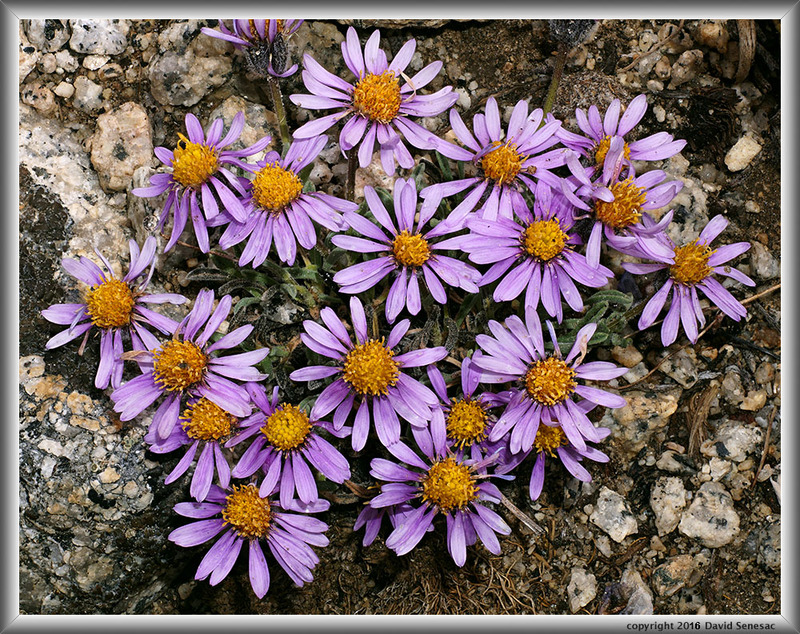 I had been eyeing dwarf alpine aster, erigeron pygmaeus, during much of the trip but had not found a strong subject until I saw the above. And the ubiquetous pussypaws, calyptridium umbellatum. Always a cooperating subject one can image frame edge to frame edge sharply. The two little brown balls were probably a product of a belding ground squirrel. During the night, stars came back out, an intermittent breeze could be heard in the trees, so it was apparent yet another weather change was occurring. As dawn Friday August 5, began to cause stars to disappear, I made plans to pack up gear and then set out back to the lupine plain for a few photos and then return back towards camp for a few others still waiting for workable conditions. After that would start a long day lugging the backpack over Pine Creek Pass and down to somewhere below Upper Pine Lake. Thus was out early and with breezes pushing waves on the surface of L Lake once again did not stop on my route around the lake and over to the lupine plains. Skies were clear sunny blue. 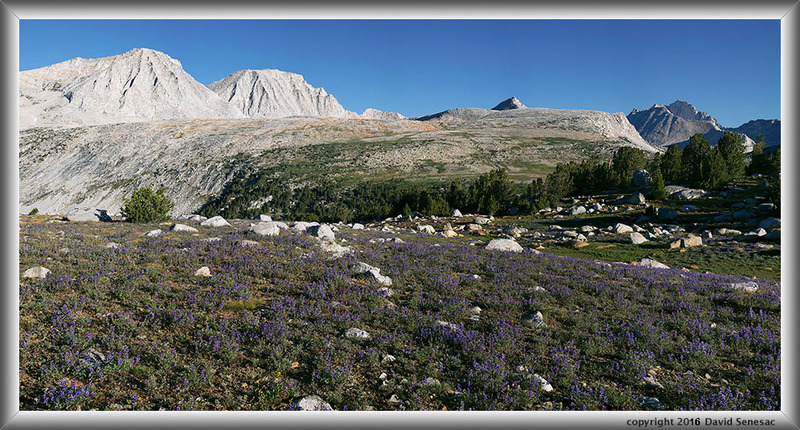 At 7:30am took the very large lupine landscape, at page top that is a 12 frame 19400 pixel wide image. Front lit on axis blue and purple flowers tend to have trouble having impact in photographic images. Here they are a bit off axis but still appear somewhat dim and would have shown a more saturated blue between 9am and 10am. But I needed to move along working other subjects near my camp. Back around the lake, I visited a pretty location on the Steelhead Lake stream but the results turned out disappointing. And up at my camp spot worked the above large panorama across L Lake waters to the northwest with the lush grass meadow and pools in the foreground. The view I enjoyed from my camp during my two days of base camping, Merriam, Royce, Feather, 12563, and Bear Creek Spire. 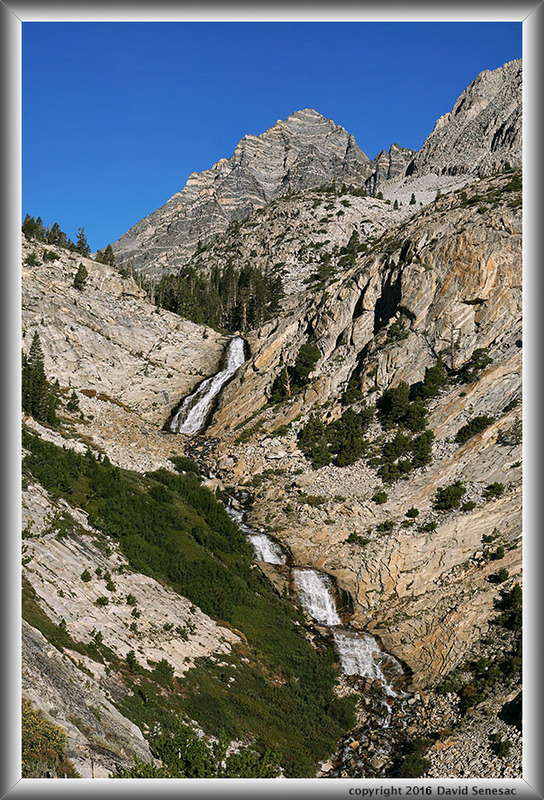 The enlarged vertical slice view, left slice shows the distant cascading stream tumbling into the canyon from Royce Lakes plus one can make out a slight purple color from lupine on the plateau just below. 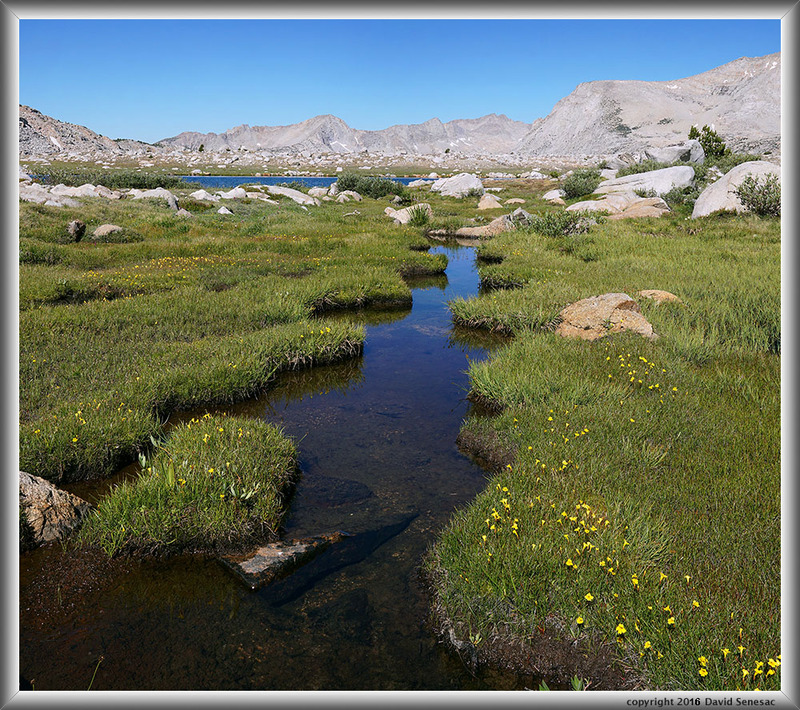 Another subject close to camp was the above small stream turf meadow pool surrounded by monkeyflowers. Tadpoles moved about in its shallow warm water. Off beyond are the wavy blue waters of L Lake. My morning photography session completed about 9:45am. It was not long before I was hefting up the backpack and moving along the lakeshore with a long effort ahead. I stopped a bit once more along the Steelhead stream for a last effort and then continued around the north shore before dropping down into the canyon below topo point 11281. Most of the way up the north side, gained the horse trail and continued on up to Pine Creek Pass where other backpackers were resting on boulders. It was a long moderately unpleasant journey down the steep trail. I stopped at a no name pond for an hour to rest and cooked a Knorr rice lunch. Then continued on down and around past the Honeymoon Lake junction and down and past Upper Pine Lake. There vectored off cross country to rarely used for camping granite slab slopes below where I crossed the creek and made camp by early afternoon. Had a leisurely afternoon there jumping into the luke cool waters. There were some mosquitoes about at times that had me putting on DEET late afternoon when more from a nearby Labrador tea jungle came to visit. The plan for Saturday morning was a quick dawn pack up and escape in order to reach the big Pine Creek cascade below Pine Lake at a decent time before light became too harsh. Thus was off and across the creek well before sunrise on Saturday August 6. By time the sun began hitting the top of nearby peaks I was moving alongside Pine Lake where I stopped briefly at the outlet before continuing down. I reached the 2 mile point near the Brownstone Mine mining road spur at a nicely early 7am where I wandered down below the trail out to a point I have shot the above subject before. Behind the bedrock cascade in the background is the peak directly behind Pine Lake that I call The Wizard's Castle with its unusual black and white granite layers. The same geology can be seen in places about upper Rock Creek. The tripod position also allows including the 3 lower cascades. On down I continued stopping frequently until reaching the scarlet monkeyflower spring near the top of page 13 that I stopped to work much of an hour before continuing the lower dusty 1000 feet back to my Forester. Lots of weekend people were about, some backpackers, some equestrian folks, and several cars with people just exploring what was up this canyon road then walking about at the trailhead. Before leaving I climbed down below the nearby bridge and did a refreshing torso dunk in the chilly creek waters. And much like that little marathon on the last day coming down the trail back to the trailhead and my vehicle, it has been another little marathon of sorts working through image processing of both the Silver Divide and Pine Creek trips then crafting up this lengthy four page feature adding to my 2016 Trip Chronicles. So yeah with these last words I am relieved to have finally reached the end. As it is now 4:17pm on Saturday August 27, I think now I'll walk down a block to the corner Walgreens and treat myself to a pricy ice cream package and a bottle of Ginger Ale.